DeSoto Springs Pond is seen during the par-3 contest ahead of the Masters Tournament at Augusta National Golf Club in 2014. Luke Donald takes a picture of daughters Sophia, left, and Elle on number seven during the par-3 contest. Scott Stallings' son, Finn, plays on the second green during the par-3 contest ahead of the Masters Tournament in 2014. Luke Donald's daughter, Elle, runs ahead of Keegan Bradley (left) during last year's Par-3 Contest. Golfers often have their children caddie during the contest, which gives the golfers a chance to get out and have fun before the Masters. Seven of the original nine holes at the Par-3 Course, built in 1958, are still played around DeSoto Springs Pond. Trevor Immelman waits on No. 9 with his son Jacob during last year's event. Raymond Floyd won the Par-3 and the Masters in 1990. Ryan Moore poses with his prize after winning last year's Par-3. Phil Mickelson stands on number nine with his caddie Jim Mackay's daughter Emma during the par-3 contest in 2014. Clifford Roberts was known for his gruff exterior and stern demeanor in running all things associated with the Masters Tournament. But he wasn’t always opposed to fun. With Roberts’ backing, the Par-3 Con­test was held for the first time in 1960. It was an immediate hit. Designed as a fun event to let competitors blow off steam before the tournament proper, it also fits nicely into Au­gus­ta National Golf Club’s mission to grow the game. The contest is held on the Wednesday before the tournament, and participation is optional. Players often invite their children, spouses or celebrities to be their caddies for a day. Though most regular professional events hold pro-am tournaments, the Par-3 Contest is open to tournament competitors, noncompeting past champions and honorary invitees. The winner of the contest receives a crystal bowl, and those closest to the pin on each hole receive prizes. Mark O’Meara, the 1998 Masters champion, was one of three golfers to make aces in the 2014 event. began televising the event in 2008. After years of long-drive exhibitions and other contests, Roberts decided right away that a new tradition had been born. 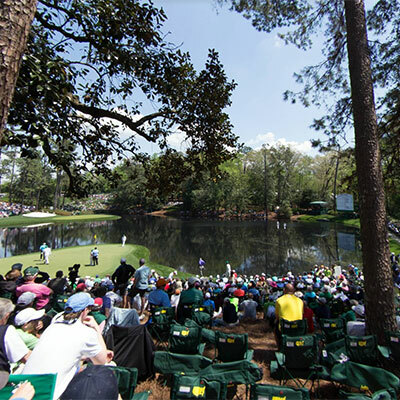 “Due to the indicated popularity of this new type of preliminary event with the patrons and players, it is likely that it will be staged again next year on the day preceding the first round of the Masters Tournament,” Roberts said in The Augusta Chronicle. The Par-3 Course might just be the most famous short course in the world. Masters co-founder Clifford Roberts helped architect George Cobb design the layout, and it was constructed in 1958. The nine-hole course plays to a par of 27 and measures 1,060 yards, and it features the same quick bentgrass greens that are found on its more famous sibling. Dwight D. Eisenhower, a member of Augusta National, gets credit for coming up with one of the key features in use today. While walking the property on one of his early visits to Augusta, he suggested to Roberts that a dam could be built east of the big course if the club wanted to build a fish pond. Ike’s Pond was built in 1949. In 1986, architect Tom Fazio designed two new holes that play over Ike’s Pond, and the course’s original two holes were converted into viewing areas for the Par-3 Contest. Seven of the original nine holes still are played around DeSoto Springs Pond. Ryan Moore didn’t back down after winning the Par-3 Contest in 2014. Two days later, Moore was packing his bags. He missed the cut by one shot with rounds of 77 and 72. No one has won the Par-3 and the Masters in the same year, though several have come close. Raymond Floyd won the event in 1990, then lost the Masters in a sudden-death playoff to Nick Faldo. In 1987, Ben Crenshaw won the warmup act and then held the 54-hole lead. He finished one shot out of the three-way playoff won by Larry Mize. Chip Beck was runnerup in 1993 after winning the Par-3 earlier in the week. prior commitment and didn’t come back for the playoff, and Harrington prevailed. Harrington also tied for first twice in the Par-3 in 2003 and 2012, but he has yet to slip on a green jacket. Art Wall Jr. (1965) and Gay Brewer (1973) share the Par-3 Course record of 20. A total of 80 holes-in-one have been made since the club kept records, including a record five in 2002. Toshi Izawa made consecutive aces that year on Nos. 5 and 6. Sam Snead, who was 61 when he won the second time in 1974, is the oldest winner. Jay Haas, the 1976 winner, is the youngest at 22 years, 4 months and 5 days. The contest has been decided by sudden-death playoff 19 times, and 11 golfers have won both the Par-3 and the Masters in their careers. Snead and Sandy Lyle each won it twice.